I ordered these during Shopbop's Friends & Family Sale (expires tonight at midnight PST). Code is SPRING25. I love them! I was worried they'd be too narrow as the last pair of LDT's were. But these are perfect, and fit me just as others have. I'm quite sure I'm keeping them, but if you see something I don't, let me know. Shown longer (1), ankle length cuffed (2), and from the back (3). So am I right, are these keepers? 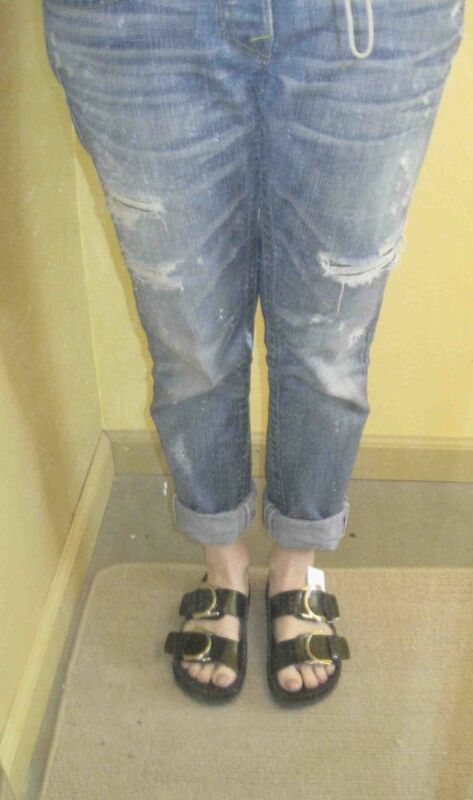 Since last year's furry Birkenstocks (Celine), this style shoe has made a come-back. (The link is further down in the article.) This is part of the overall fashion trend of comfort right now, which Inge blogged about recently. I have purchased three sandals that fit in the comfort category from Zara, two are modeled below, the third pair on its way. I've seen other ones but for $300 I'm preferring Zara's lower price points. What do you think? I really like the comfort they promise. But are they in any conceivable way, stylish looking? Or is this another example of me drinking the Mom jean Kool-aid? Can I pull this off, and are they suitable for someone my age? Pictures 1-3. Zara Birk knock-off with buckle. Pictures 4-7. Zara Bio sandal. Picture 8. The awaited Track Sole sandals. I have purchased and returned two backpacks so far. Both of them fail mainly on this point: they are way too big on my petite frame. They look so different on the models! I guess I need to start re-imagining bags on my short self the same way I re-imagine tops, coats etc. Pictures 1 and 2 -- Rebecca Minkoff Logan backpack (now sold out) on just barely 5'4" me and the 5'11" model. Pictures 3 and 4 -- Same comparison with the Rachel Zoe Montana backpack. Picture 5 -- The backpack that I now have on order is the B Brian Atwood Juliette backpack. It looks dinky on the model so it might just work on me! I also like that it is more structured. Pictures 6 - 8 -- Freebird Esquina booties. I haven't been able to wear these yet because summer lingers on, I'm still in sandals or work clogs. I jumped on these in early August before the fire (breaking one of my rules not to buy fall merchandise until October-November) because I was afraid they would sell out. I see they are in stock again. They are comfortable and something in between a Western boot/pointy toe bootie/oxford. Note how they work with a cropped pant!